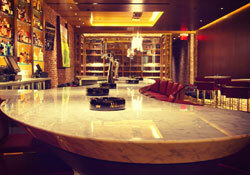 Ashton is proud to introduce the new gold standard in cigar bars and lounges. In the heart of Philadelphia's Center City district, Ashton Cigar Bar is located on top of Philadelphia's oldest and finest cigar store, Holt's Cigar Company. Featuring a beautiful, contemporary design and warm, comfortable atmosphere, Ashton Cigar Bar is a sanctuary for lovers of fine cigars and spirits. With a world-class selection of 200 premium cigars, 250 whiskies and 400 total spirits, Ashton Cigar Bar also offers an expansive selection of specialty craft cocktails. The perfect setting to enjoy a drink and a fine cigar, Ashton Cigar Bar is the ultimate oasis for indulgence in life's pleasures. Our friendly, knowledgeable staff and state-of-the-art air-purification system will guarantee you enjoy the utmost in service, pleasure and relaxation. Explore the extensive cocktail and liquor menu here.